One of about a half dozen tabs that I always have open in my web browser on my desktop or laptop is Google Reader. Even though other sources such as Twitter and Facebook are now better at uncovering news more quickly, Reader remains a great catch-all backup plan for the content I read online. But I’m increasingly finding myself browsing for news on my iPhone. And sadly, all the Google Reader applications that have launched over the past few years have, in my opinion, sucked. And I’m hardly the only one who thinks that. But that changes, today. 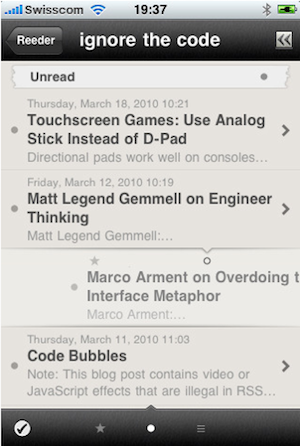 An app called Reeder, by Silvio Rizzi, has always been a nice-looking app that syncs with Google Reader. Unfortunately, it has also been clunky, and slow, and lacking some features such as state-saving. But the latest version, 2.0, which just went live in the App Store last night, corrects all the issues I had with it. It’s wonderful. I have absolutely no doubt this will be one of my most-used apps now. In fact, I’m so sure of it, that I’ve already placed it on my the first page of apps on my iPhone screen. So what makes it so good? Well, first of all, it’s simple. Rather than trying to cram is all of the clutter items that Google Reader itself now crams into its own site, Reeder focuses on three key areas: Unread items, Starred items, and All items. These are the three key areas across the bottom of the app. The only other icon down there (on the main screen) is a reload button to load in new feed items. 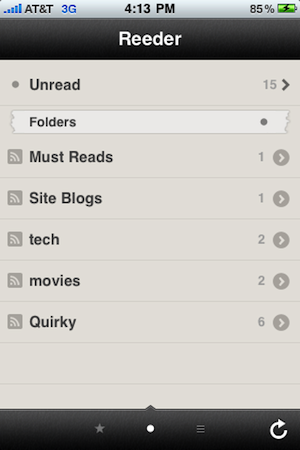 Assuming you group your feeds into folders in Google Reader, navigation is Reeder focuses on that. So, for example, when I click into my “tech” folder, I see all the unread feed items that have appeared since the last time I opened Google Reader. I can sort these by individual feeds or by time in which the items came in. Obviously, clicking on an individual story loads that item (including any images). And in the story-view mode you have a new set of options along the bottom that let you mark an item as unread, star it, or a button to load a range of great Reeder features. For example, on this overlay menu, you can make a Google Reader note about an item, you can share it with your Reader friends, you can save it to Instapaper, you can send it to Twitter, you can open it in Safari, you can mail it to someone, etc. There are a half dozen other features which you can customize in the app. As you’d expect, Reeder gives you the ability to sync feed items locally so that you can read them when you don’t have an Internet connection, such as on a plane. Previously, as I mentioned, syncing was slow. With version 2.0, syncing speed screams. And, there is also an option to only cache images if you’re connected to WiFi, to keep things moving alone. If you haven’t been using the iPhone for a long time, news of a great feed reader may sound lackluster to you. After all, it’s been almost two years since the launch of the App Store now, it may be hard to believe that no one has nailed a simple feed reader app yet. But that has been the case. A few are okay, like NetNewsWire and Byline, but none have been great on the level that Tweetie is great as an iPhone Twitter client. In fact, I’d say the best feed reader on the iPhone up until now has been the mobile web version of Google Reader itself. But that too is only good, not great. 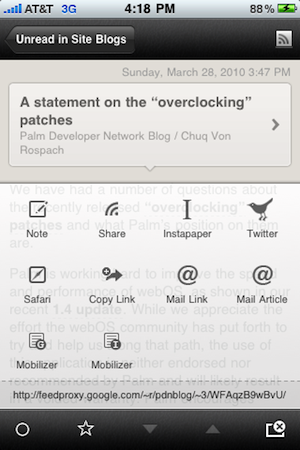 With Reeder 2.0, I think we finally have a great iPhone feed reader. Its combination of speed, simplicity, and beauty make it a must-have app in my opinion. Now the only hard part will be waiting for a native iPad version to come out that supports things like dual-pane views to more easily go through feed items on the larger screen. But now I’m just being greedy. I’m just happy to finally have a solid feed reader on the iPhone. 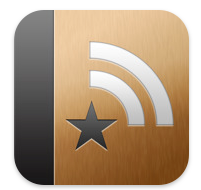 You can find Reeder 2.0 in the App Store here. It’s $2.99.